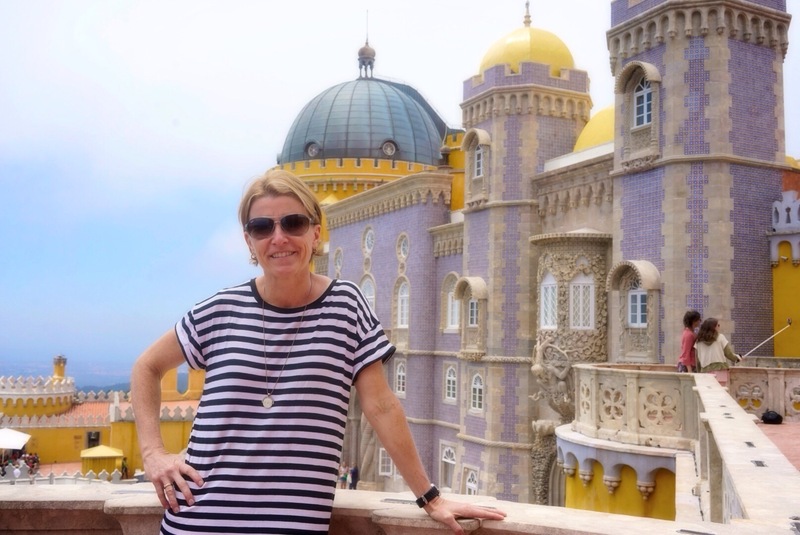 Today we actually go to Sintra, as we have to leave beautiful Lisbon, and head north 300km to the second largest city in Portugal, Porto…home of Port. 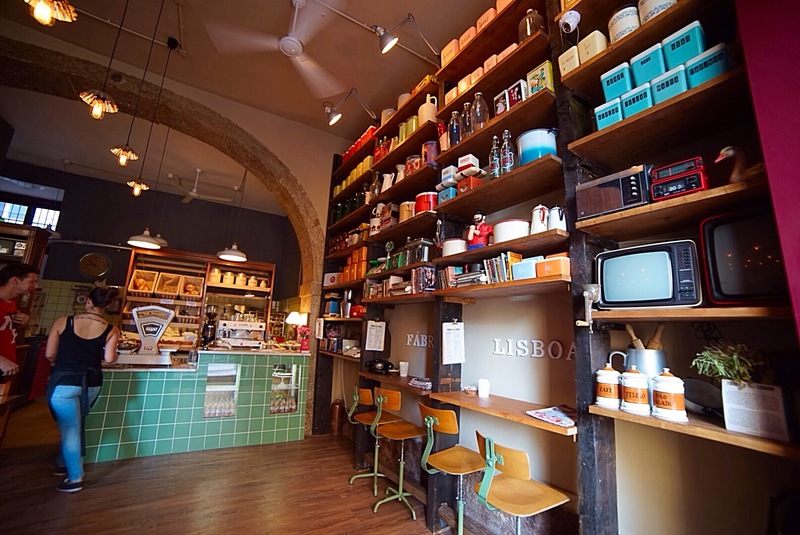 Before heading off we have breakfast next door at a smashing little cafe, full of brick-a-brack on the walls, and the best croissants in town. I wish we had something similar back home, it would kill it. Lisbon has been wonderful, and deserves a longer stay, but time is afoot, and we need to push on. It’s going to be a busy day! 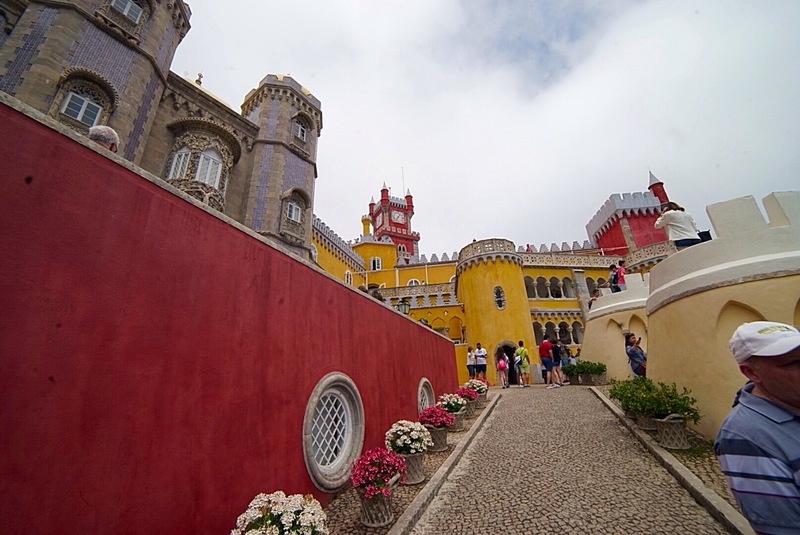 Sintra is another heritage site, Unesco have been busy handing these awards out, and has numerous sites worthy of our attention, but time constraints mean we can only visit two, and in an abridged version at that. 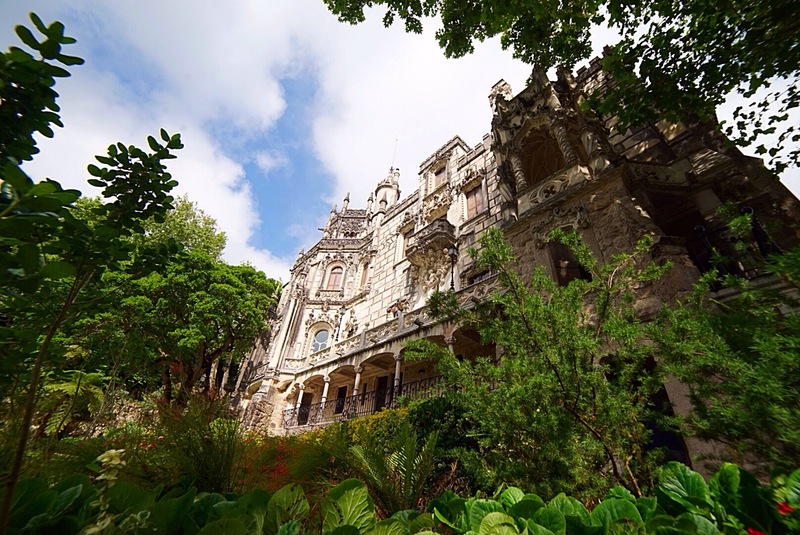 Without too much trouble we find a carpark in town, and head off by foot to our first pit stop, Quinta da Regaleira, which is just down the road. 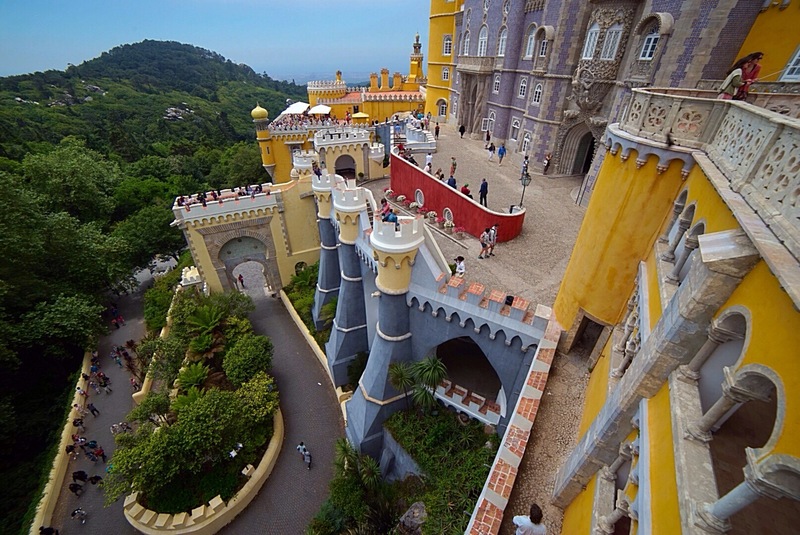 It is home to a smallish palace, and the most amazing gardens, filled with wonder and surprise. 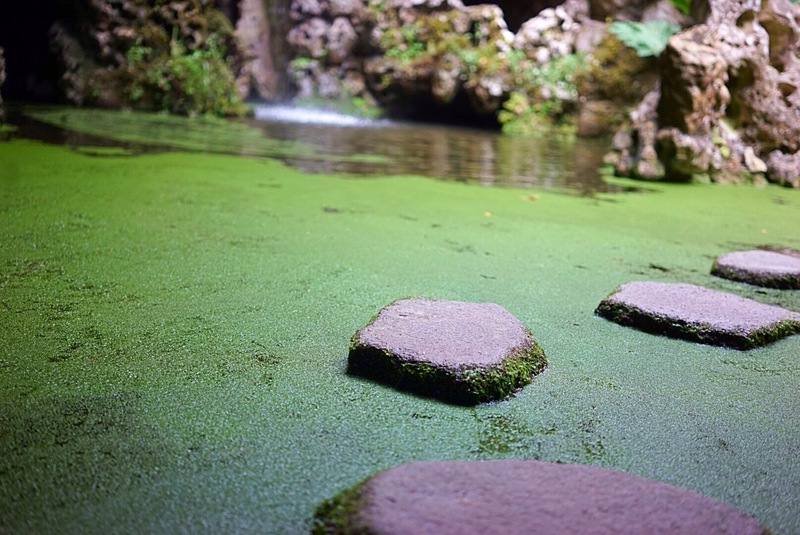 Everywhere you go is hidden grotto, for waterfall with linking tunnels. 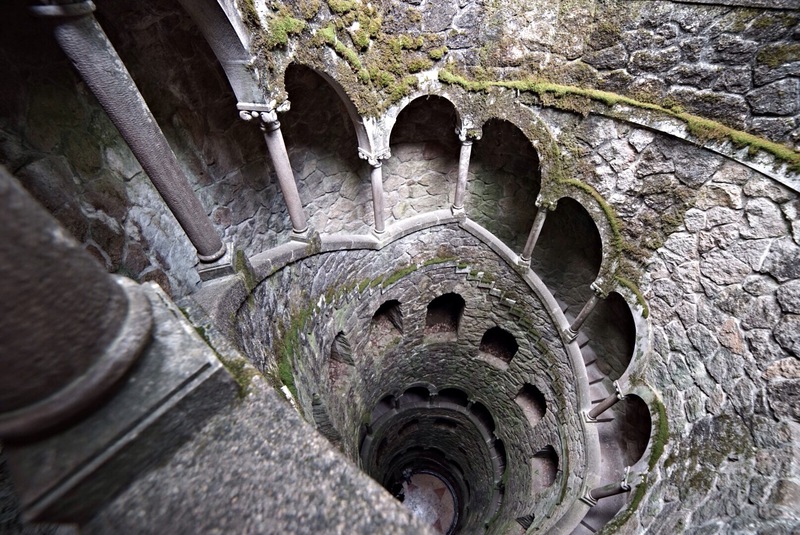 Subterranean towers with spiral staircases, nooks and crannies, lookouts and towers, surprise after surprise. We spent about an hour wandering around, finding interest around every corner. A really great place, beautiful! Time against us we needed to push onward and upward to our second, and last stop, the Palace of Pena and surrounding gardens. I mentioned ‘upwards’ didn’t I? Being the geniuses we are, we proceeded to walk to Pena. To walk UP to Pena, and to walk and walk and walk. UP!! For 40 minutes, the equivalent of 128 floors according to our trusty Iphone App. UP! A lovely walk, and all, but holy moly! Here we are, time poor, and we decide now is a good time to start our Everest training! 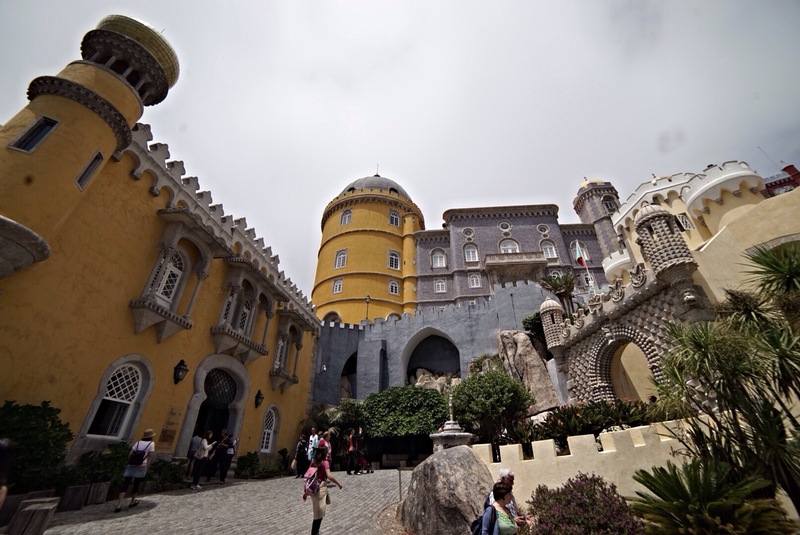 The Palace of Pena, by the way, is strikingly majestic! Once we finally got to see it! The colours and shapes are awe inspiring, the Palace sitting high above the stone hills that give it an incredible view over the valleys way below. 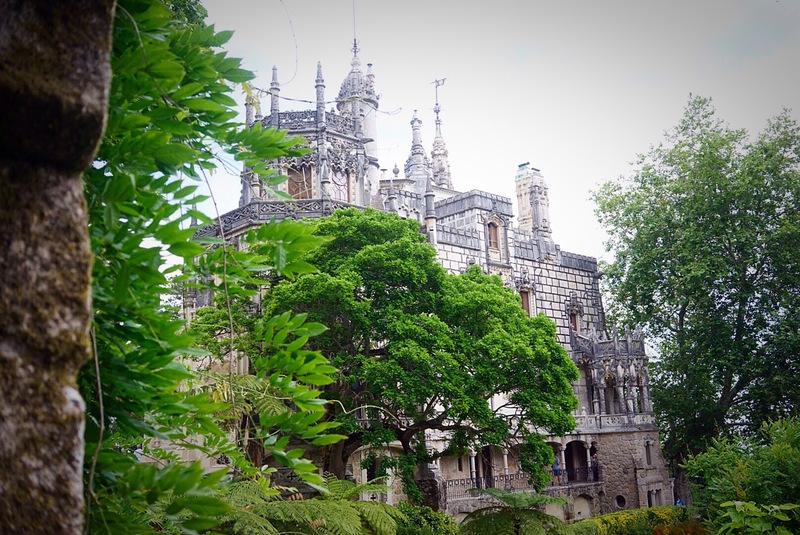 The building is regarded as one of the finest examples of nineteenth century Portuguese Romanticism. Built by the royal family, it was handed over to the state in the early twentieth century, and declared a Unesco site in 1995. 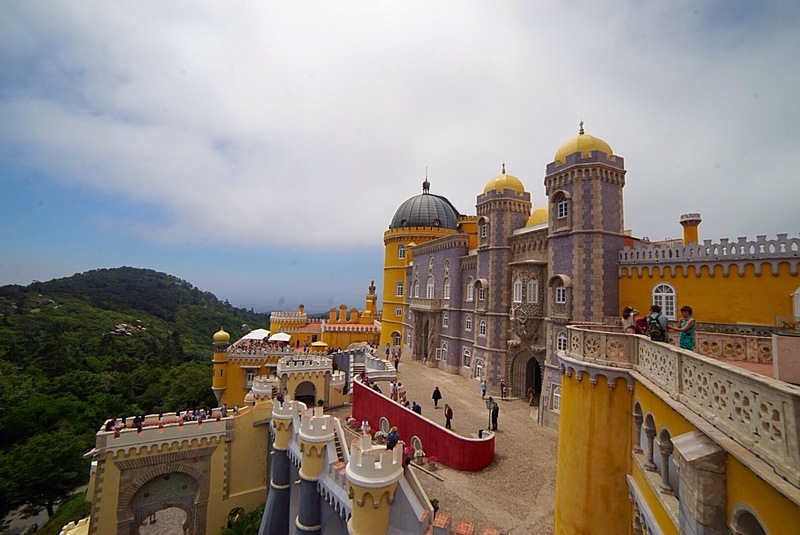 If you ever happen to visit Lisbon, Sintra is a must see. Maybe for more than a few hours though! We had to get moving, so no walking back down, bus time which took about five minutes….exhausting!! Quick lunch, then on to the tollway north to Porto. The tollways are great, 120km limit, completely ignored by every Audi & BMW that shot past like tracer bullets, but such an effect way to get from point A to B in the quickest time. 300 km took about 2.5 hours and we were in downtown Porto….in peak hour, on narrow one way streets full of cars, buses, taxis, and pedestrians. Plus a GPS trying to send us up one way streets the wrong way! Finally found a 24hr carpark, and hoofed it up the hill to our apartment….and a brilliant apartment it is, perfect position, plenty of room, a hammock….and a lift!! Ours is the one above the ‘E Barato’ sign. 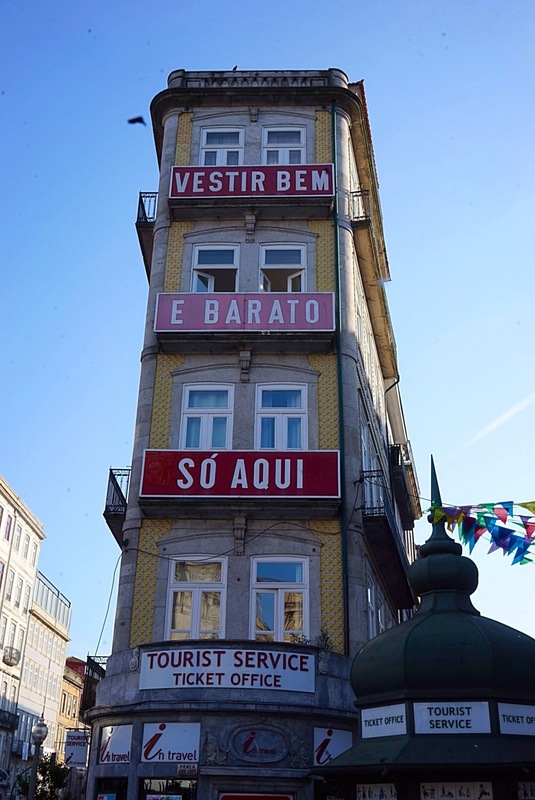 Porto is fabulous, such an exciting town. Our host had left a couple of pages of suggestions for places to eat, drink and see, so we followed her suggestions and firstly found a bar that made great sangria…and they did, delicious! 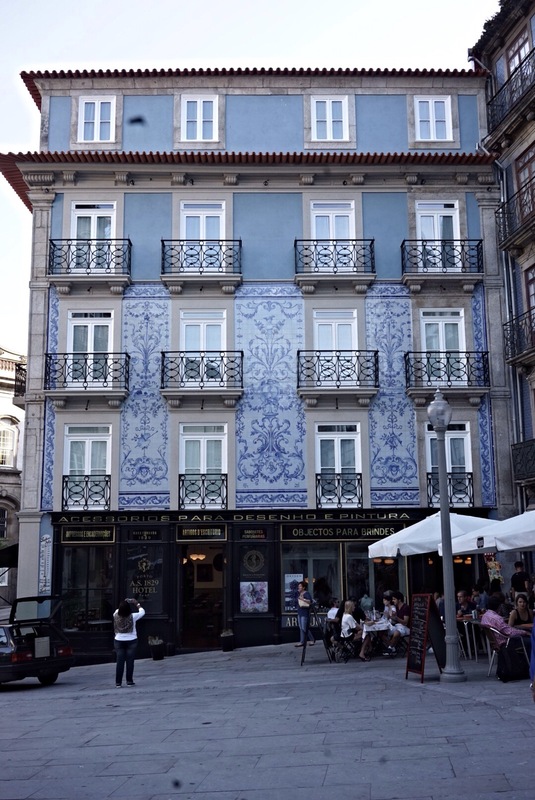 Then we went to a cafe that she recommended for the Portuguese specialty ‘francesinha’ which is a mixed meat sandwich with melted cheese….yuck! We have tried to make a point of looking for interesting eateries which don’t have laminated menus and huge photo displays of their food (i.e. Touristy crap! ), and up until now our judgement has been pretty sound…..up until now! The cafe suggestion was ordinary in the extreme, more ‘Coles cafeteria’ than restaurant, but with restaurant pricing. Lesson learned, follow your instincts from now on, and move on. So we will, to tomorrow. We’ll get back to Spritz, don’t you worry Beary.